In my previous post, I shared the first three statements spoken by Jesus Christ while hanging on the cross (His “deathbed”) and making atonement for sin. Listed below are the other four statements in their chronological order. After hanging on the cross for three hours, darkness blanketed the earth. The kind of dead, black darkness that disallows you to see your hand in front of your face. When forsaken by His brothers, followers, apostles, etc., Jesus had always had God to turn to, but now even God the Father turned His back! When that happened, Jesus could hold His silence no longer. Matthew 27.46 says that Christ “cried out with a loud voice saying, ‘Eli, Eli, lema sabachthani?’ that is, “My God, my God, why have you forsaken me?”” The term translated “cried out” could just as easily describe the loud, raging roar of a lion. Keep in mind that Jesus was the eternal Son of God and had forever enjoyed the sweetest, most intimate fellowship with the Father. Our finite minds can’t comprehend it, but that didn’t change even when Jesus took on flesh and became a human being. For 33 earthly years, He and His Father had enjoyed that same, incredibly rich relationship…until now. On the cross Jesus “became sin for us” (2 Cor. 5.21), that is, He took upon Himself the sins of all humanity and experienced the full fury of God’s wrath against those sins. 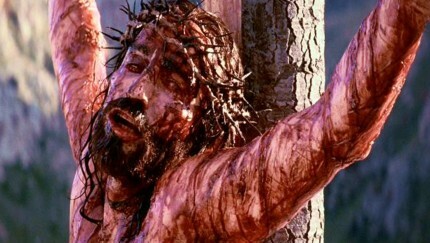 The punishment for ALL MY SINS was poured out on the sinless Savior! Previews give us a glimpse of what to expect in a future episode of a TV program or an upcoming movie. Jesus, hanging on the cross and being forsaken by God, gives us a preview. A preview of what? you ask. A preview of HELL! Those who reject Christ as their Savior essentially tell Him, “I don’t want You to be a part of my life! Leave me alone!” Well, if a person dies that way, they get their wish for all eternity: “[Unbelievers] shall be punished with everlasting destruction from the presence of the Lord, and from the glory of His power” (2 Thes. 1:9). Therefore, Christ on the cross, forsaken by God and being punished for (our) sin, gives us an awful preview of Hell. How ironic that the One who had earlier said, “If you believe in Me, you shall never thirst again” (John 6.35), is now the One who is thirsty. Jesus has been hanging on the cross for six hours (cf. Mark 15:25, 34). When you consider the incredible stress Jesus experienced in the Garden of Gethsemane, His loss of blood from the scourging and the crucifixion, and his exposure to the Middle Eastern sun, it’s easy to understand how raging His thirst had become. At the beginning of the crucifixion Jesus was offered a drink of wine mixed with myrrh (Mark 15.23), which was designed to have a mildly numbing effect. He refused it, choosing rather to experience the agony of the cross with full clarity of mind. Now that death is near, Jesus takes a few sips of sour wine and thereby moistens his mouth to loudly proclaim His final two statements. For a little silver Jesus was betrayed into the hands of jealous religious leaders. For 12 hours He has been in the hands of violent and wicked men. Now, He is more than ready to entrust His spirit into the Father’s hands! His redemptive task is complete. It is time for Him to enter into His well-deserved rest. Whenever you’re by the side of a dying family member or friend, you lean in to catch even the faintest of their expressions, not wanting to miss anything. The final words uttered by a person before their death are often of great significance. Never has this been truer than in the case of the Lord Jesus (God the Son), whose deathbed was a cruel, rugged cross! While suspended between Heaven and earth, Christ made seven statements that are like windows through which we can see what was foremost on His heart and mind. Three of these statements were made before darkness, three after, and one during. The first, last and middle were prayers. Listed below are those three of those seven statements in their chronological order. No Gospel account gives all seven, requiring us to compare and compile the accounts in order to discern the order. The other four statements will be discussed in my next post. How different was Jesus’ response and spirit from ours most of the time! When we are mistreated we want revenge. We hold grudges. We become sullen and bitter. Here are Jews and Gentiles alike, Roman soldiers and Jewish religious leaders, killing the Son of God, the Messiah of Israel, the Savior of the world, the perfect and spotless Lamb of God. And amazingly, Jesus is praying for their forgiveness. Now some would contend, “Since they don’t know what they are doing, they’re not guilty. And if they’re not guilty, they don’t even need forgiveness”? But John Piper argues that Jesus draws attention to their ignorance of what they are doing and asks God to forgive them because they are guilty for not knowing what they are doing. In other words, they should know what they are doing and are guilty for not knowing what they are doing. For over three years, Jesus has been demonstrating his power over death and disease. He’s been teaching with unprecedented authority. The evidence of His being the Messiah was as plain as the nose on their face! They didn’t know, but they should have. Essentially, the prayer of Jesus, was an appeal that time should be granted them for repentance, time for them to hear preaching, time to awaken their consciences to their desperate and eternal need of a Savior. And because of God’s amazing grace, this prayer was indeed answered (Acts 3:12-15,17; 4:1-4)! He rebukes the other criminal and gives indirect evidence of his own fear of God (Lk. 23.40). He admits his own guilt (41) and accepts the punishment for his crimes (40-41). He agrees with Pilate’s assessment and finds no fault in Jesus (41b), acknowledges Jesus’ royalty (42), and humbly asks Jesus to remember him when he comes into His kingdom (42)! While hanging on a cross, this thief “bows his knee,” accepts Jesus as his Savior and Lord, and soon thereafter joins the Lord in Heaven! Note: His destiny was not secured by baptism or good works! What a wonderful demonstration of Jesus earlier declaration: “He that comes unto Me I will in no wise cast out” (John 6.37). While suffering excruciating pain, Jesus selflessly turns His attention to His earthly mother. From the pulpit of His cross, Jesus preaches to all ages a sermon on the Fifth Commandment: “Honor your parents!” While the years of juvenile obedience come to an end, the years of honoring one’s parents are not supposed to end. Essentially, Jesus was asking John to adopt Mary as his own mother and provide loving care for the balance of her life. What a compliment to John to be so trusted. John became a substitute for the Substitute! If you are wondering why Jesus didn’t entrust Mary to the care of His brothers, it’s because they did not yet believe in Jesus (Mt. 13:53-58; John 7:1-5). Evidently, Jesus preferred to put Mary in the care of an “adopted, believing son,” rather than her own unbelieving sons. I plan to address the other four statements in my next post, but for now, please know that Jesus Christ made these statements while making atonement for sin, YOUR SIN: “He is the propitiation for our sins, and not for ours only but also for the sins of the whole world (1 John 2:2)!